The first current-gen Final Fantasy will be out within the next year, it'll serve as something of a stopgap before Final Fantasy XV, and, well, it's got kind of a silly name. 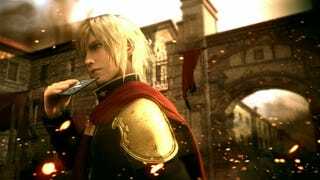 RPG fans have been waiting a very long time for Final Fantasy Type-0, which was released for PSP in Japan way back in 2011 but has yet to make it to western shores. So when publisher Square Enix announced an HD remake for PS4 and Xbox One at E3 this year, people were stoked. Finally, we'd get to play this thing in English. But if you're anything like me, you've got a lot of questions about this HD remake, mostly because Square Enix has yet to show any real gameplay footage from the game. Don't stress: I saw it today, it looks good, and Square promises they won't make us wait much longer to play Final Fantasy Type-0. Let's go through some of the biggest questions I had about the Type-0 remake. 1) When is Type-0 HD coming out? Within the next year, Tabata says. We won't be waiting longer than 365 days. Tabata and Square won't commit to a concrete release date yet, but by August of 2015, we should be playing this game. "We probably wouldn't age another year until it's released," Tabata said. "We really do want the PS4 and Xbox One install base to grow in Japan as well, so we do want a release as quickly as possible." Though Square's seemingly-hasty announcement at E3 this year made it seem as if the company had only recently started working on the HD port of Type-0, Tabata told me they've been developing this game since mid-2012, when the company shifted development of Final Fantasy XV to PS4 and Xbox One and started getting a feel for those new consoles (which at that point had not yet been announced). "I started to be involved around July 2012ish," he said. "And at that time, I started to gain a better understanding of the PS4/Xbox One console, and really liked the environment of the platform itself, and I believed it would be a good fit for Type-0 as well." 2) Why Xbox One and PS4? Why not Xbox 360 and PS3? Because Square Enix is concerned about Final Fantasy XV. They want to make sure Final Fantasy fans own current-gen consoles, and Type-0 is their way of helping get people to segue into the modern generation. This was something I had assumed when the HD remake was first announced, and Tabata confirmed it this afternoon. "Is it fair to say that this Type-0 HD remake is meant to get more people to buy PS4s and Xbox Ones for Final Fantasy XV?" I asked. "There is a part where we believe it's kind of like the first step," Tabata said. "When we released Type-0 on the PSP in Japan, we were able to garner a new audience, a younger user-base. There's a lot of fans who say that Type-0 was their first Final Fantasy, so we're hoping that'll be the same for the overseas market as well, in kind of garnering and capturing that new age group when a lot of our Final Fantasy fans are becoming older, more mature. "We do hope that it becomes the first basis for Final Fantasy XV when we release that globally." Plus, Tabata added, he has no experience developing games for Xbox 360 or PS3, so those were never really considered. 3) Is Type-0 ever coming to portable systems? Don't count on it. Though Sony flubbed the Type-0 HD announcement, at first declaring that it would be released on Vita before realizing they'd screwed up, Tabata says that was never part of the plan. "We did consider whether a Vita version would make sense for the title or not," Tabata said. "And then afterwards—this is actually something I realized after creating the PSP version—in order to really bring out the best in this title, I felt that a bigger screen would be more appropriate in terms of the depth that it provides and the distance you have to the enemies, to the characters. It just made more sense to take it to the big screen. "In terms of controls, also, it made more sense to have these sort of intuitive controls that are available for the console. In addition to that, I am aging as well, and my eyesight is getting worse, so it was easier, naturally easier to develop something for the bigger screen versus the smaller screen." Tabata says they have no plans to release an English PSP version digitally, either. "That is not being considered," he said when I asked. "First and foremost, we want to get the packaged version to PlayStation 4 and Xbox One." 4) Is it true that Square Enix was planning on localizing the PSP version but changed their minds because of business realities? Yes. Last month, I reported that Square had done the bulk of localization work on Type-0 way earlier, back in 2011, but the PSP's sinking popularity outside of Japan led Square Enix to scrap plans to release Type-0 in the United States and Europe. Tabata confirmed this today, saying they put a hold on the PSP release outside of Japan when they realized the PSP marketplace wasn't all that viable anymore. "The biggest reason really was the timing," he said. "After we released the Japanese version, and then it would go into localization, the US PSP market at the time was kinda shrinking. It wasn't the best time for us to garner the best results, so that was the biggest reason we had to forgo the PSP version for the overseas market." 5) Will Type-0 HD's development delay Final Fantasy XV at all? Tabata, who is both directing Type-0 and co-directing Final Fantasy XV, says no. XV, which was first announced as Final Fantasy Versus XIII almost a decade ago, is their top priority. "So I had personally, I do want to really kinda push the install-base for PS4 and Xbox One in Japan as well," Tabata said. "I believe that FFXV would play a big factor in that, so I'm prioritizing my time for the development of that, to make sure it releases as soon as possible. Currently for the other titles I'm directing, including Type-0, since we're not building the game ground up, the contents already exist. We're at the point where we're just fine-tuning and balancing the game. My personal time spent on the tuning and balance and whatnot is about 10-20% of my time. "We have an amazing development team working on this project that I trust, and there are segments that I kinda leave it up to them to make the final calls on." 6) How do Type-0 and Final Fantasy XV differ? When you see Final Fantasy Type-o in action on a big screen, it's hard not to think of Square's big E3 2013 presentation of Final Fantasy XV. There's blinking, jumping, and all sorts of high-octane action that makes it all feel more Kingdom Hearts, less traditional Final Fantasy. "As an over-arching theme, Type-0 is a war-themed game, so it's kind of like a war movie in a sense. Whereas XV is a road trip kind of movie and adventure that focuses on brotherhood. The overarching theme is kind of different in terms of scenario." 7) Are they adding any new content that wasn't in the PSP version? Nope. No new story or challenge modes or anything like that. The three main differences are A) high-definition graphics; B) new controls for traditional controllers; and C) difficulty modes, because a lot of Japanese fans told Square Enix that Type-0 was just too hard. "In the PSP version, the conclusion, the ending, was actually very well received," Tabata said. "But since it's an action battle, and the difficulty's a little higher, not everyone was able to reach that ending... We wanted everyone to really experience, to make it to the end to see the conclusion for themselves. "At dinner last night, [translator Amy] told me that she wasn't able to reach the end because action battles were a bit too difficult, so I'd like to apologize for that." So the HD remake of Type-0 will have four different difficulty modes, designed to give people options when it comes to how tough they want it to be. 8) Does the game look good? I think so. Don't expect a traditional Final Fantasy here, and don't expect something that pushes the boundaries of what the PlayStation 4 and Xbox One can do—this is a remake of a PSP game, after all—but the few minutes I saw of Type-0 made me want to play more. This will be the first single-player Final Fantasy game on current-gen consoles. It's hard not to look forward to that.